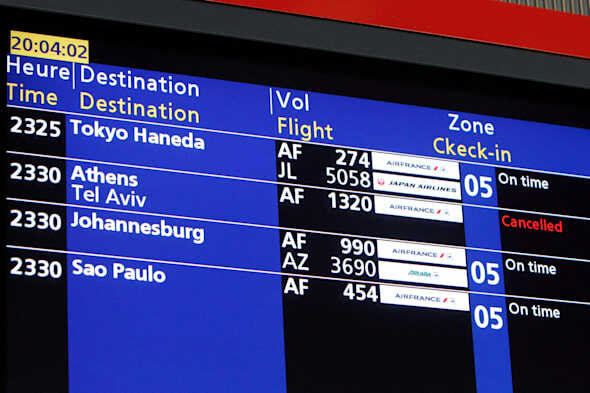 BERLIN (AP) -- Air France and Germany's two largest airlines on Wednesday canceled more flights to Tel Aviv because of safety concerns amid the fighting between Israel and Hamas. Lufthansa and Air Berlin extended their cancelations through Thursday and Air France said it was suspending its flights "until further notice." The European Aviation Safety Agency late Tuesday said it "strongly recommends" that airlines refrain from operating flights to and from Tel Aviv. It said it would "monitor the situation and advise on any update as the situation develops." EASA acted after the U.S. Federal Aviation Administration prohibited American-based airlines from flying to the airport following a Hamas rocket explosion nearby. The FAA dropped the ban just before midnight Wednesday. Lufthansa said its decision applies also to its subsidiaries Germanwings, Austrian Airlines, Swiss and Brussels Airlines. In all, 20 flights from Frankfurt, Berlin, Munich, Zurich, Vienna and Brussels were cancelled for Thursday. The airline initially had suspended flights for 36 hours through the end of Wednesday. Those cancelations were extended because "at the current time there is no sufficiently reliable new information that would justify a resumption of air operations," Lufthansa said. Air Berlin said it is continuing to evaluate the situation to determine whether further cancelations are necessary. KLM, Alitalia and Scandinavian Airlines were among other European airlines that also canceled flights Tuesday and Wednesday. Polish airline LOT said it would suspend flights to Israel through July 28. Iberia said it had cancelled its Wednesday night and Thursday morning flights to Tel Aviv, and UK-based budget airline easyJet cancelled its Thursday services between its European bases and Tel Aviv. British Airways, however, said Wednesday it hasn't canceled any of its twice-a-day Tel Aviv flights and had no immediate plans to do so. A spokesman stressed that British Airways wouldn't fly to Israel if it thought it was unsafe, adding that "each airline draws its own conclusion" on safety. Aviation security expert Chris Yates said British Airways would have assessed the situation with input from the intelligence services and ultimately concluded there was an acceptable level of risk. He said this may be because the rockets from Gaza "are fairly rudimentary and can't be targeted easily at planes in flight." Yates said other airlines might have cancelled flights fearing the possibility that rockets could strike their plane on approach or take off, but that Israel's Iron Dome defense system makes that very unlikely.